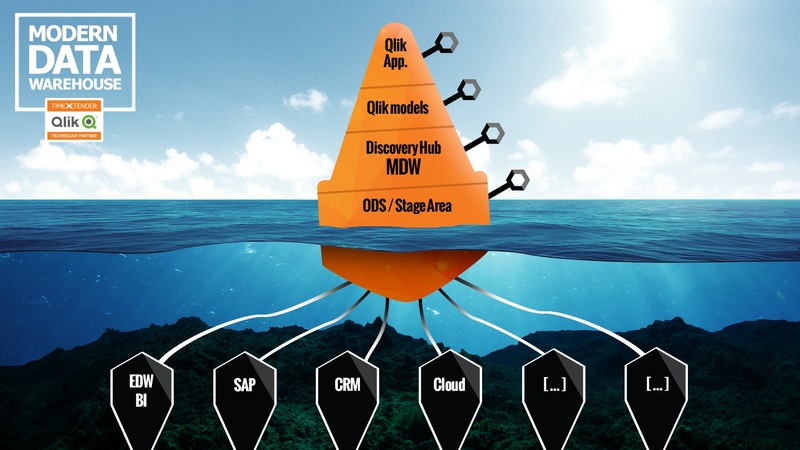 TimeXtender & Qlik now provide the world’s most comprehensive end-to-end solution for Qlik users. TimeXtender democratizes access to corporate data, enabling business users and liberating IT. TimeXtender’s TX DWA, coupled with either Qlik Sense or QlikView, puts user-friendly data in the hands of the right people at the right time. It protects the data in a secured and governed fashion displaying the data in a stunning, analytical visual presentation, and helping organizations to reduce the gap between business and IT to realize the numerous benefits of a modern data infrastructure. Following is an overview of how this is accomplished in four easy steps. 1. Data Access Simplified ODS/Stage Area First, TimeXtender combines all the data sources into a single staging area. This means analysts have only one source they need to connect to. 2. Data Quality and Consistency Maintained Discovery Hub/MDW Next, TimeXtender automates the comprehensive steps involved in data preparation. Golden records are generated when data from different systems are combined into a single set. When quality issues arise, or bad data is found, the error is corrected once, for all users. And TimeXtender keeps meticulous historical records so there is one trusted version of the truth. Note: (In this step, TimeXtender brings in all data and will not make any decisions about which data will be used. This is a major difference between our approach and the classic approach of building out a star schema where only select data can be discovered. By keeping things simple, we’re enabling success). 3. Self-Service Enabled Pre-built Qlik models When specific data sets are collected and optimized for Qlik, business users can access them without any knowledge of the underlying data structures. That means they don’t have to ask anyone in IT for help. 4. Democratization Achieved Qlik applications Finally – through the use of various Qlik applications, business users can create and customize dashboards and reports, independently – making this truly an enterprise wide BI solution. Proven Results: Actual Case Study Related to this is a success story explaining how TimeXtender’s DWA technology helped Intersig, a steel manufacturer, overcome their BI challenges. You can also find out more here to discover how TimeXtender's DWA platform, TX DWA, eliminates scripting in QlikView and Qlik Sense. Also, you can learn more here about how the Modern Data Warehouse is powered by Data Warehouse Automation (DWA).